Pan fry the bacon and take out the meat to drain. Pour out excess grease and sauté the onion in the leftover bacon fat. Add the mushrooms and cook for 5-10 mins, then add the olives and some garlic if you want. Don’t forget to taste and season if needed. Since you have bacon and olives, you probably won’t need much if any. While things are cooking, prepare your greens and chop the broccoli. 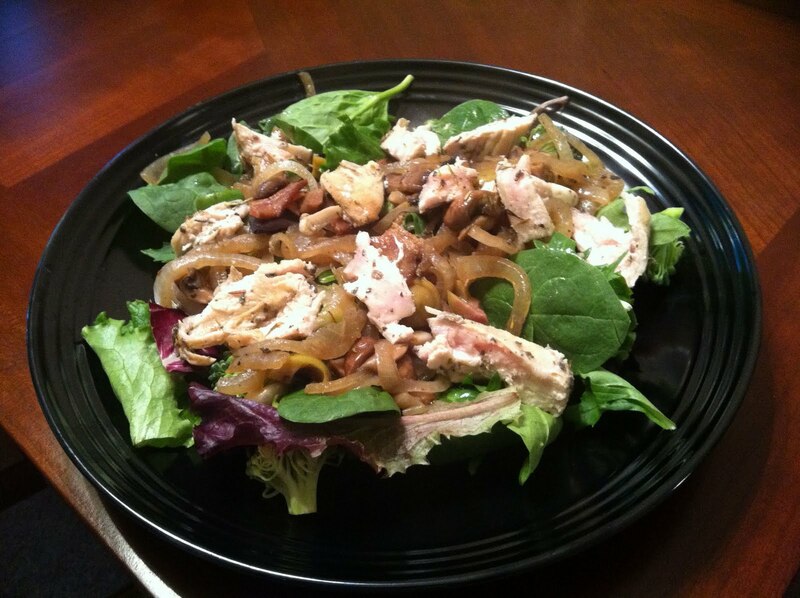 Layer your salad greens and broccoli, then the onion, olive, and mushrooms. 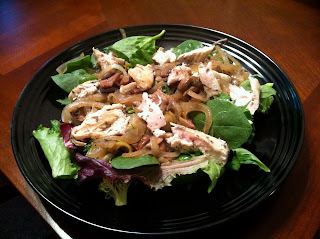 Then slice your chicken and add to the top of the salad. You don’t need cheese, croutons, or dressing. Finish this salad off with cracked pepper and lemon. That is all. The entire salad is no more than 375-400 calories (and only half of it is shown in the picture). This entry was posted on May 20, 2011 by cavegrrl. It was filed under food, paleo, salad .